01-09-2015 : Tamilnadu Teachers Eligibility Test Weightage Marks and 5 % Marks Relaxation case was heard at Honourable Supreme Court. The court ordered the complainant Mr.Vincent to file reply for Tamilnadu Government's appeal in the TNTET Exam Case. 18-08-2015: Tamilnadu Teachers Elegibility Test 5% Relaxation and Weightage Marks case hearing date has been postponed to 1st September 2015. 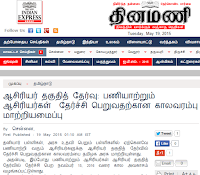 23-06-2015 : TNTET Notification 2015 soon - A news article from Dinamalar Vellore Edition Today. The newspaper article says that Tamilnadu Teachers Recruitment Board will soon publish announcement notification of Tamilnadu Teachers Eligibility Test 2015. The TNTET Exam will be conducted after two months of the notification of the same. So be prepared to face the tough competition. All the best ! 19-05-2015 : Government Aided and Private School Teachers should pass the TNTET exam before 15-11-2015 - School Education Department latest Communication. The final hearing on TNTET weightage marks and relaxation cases in the Honarable Supreme Court was adjourned to 21st April 2015 . Next TRB TNTET Exam in August 2015 ? According to the Tamil Hindu newspaper article, there are about 10,000 total Teachers vacancies in Government Schools of Tamilnadu. The process to fill up those teachers vacancies is expected to be started in the month August 2015. TRB TNTET Weightage and Reservation Case is adjourned in the Hon'ble Supreme Court of India. The case came for hearing on 30-03-2015 . The Tamilnadu Government and Teachers Recruitment Board (TRB) seeked more time to reply. So the Hon'ble Supreme Court gave 2 more weeks and adjourned the case . Free TET Exam Coaching Classes for ST candidates by District Institute of Education and Training (DIET), Salem. Eligibility : ST Candidates should have registered their B.Ed certificates in the Employment Offices before 31st March, 2014 . How to Join in the Coaching ? Candidates have to register their name in the DIET Office, Uttamacholapuram, Salem on or before 31st March 2015. There is a latest news article about next TET exam in Tamilnadu is published in the PuthiyaThalaimurai news website. 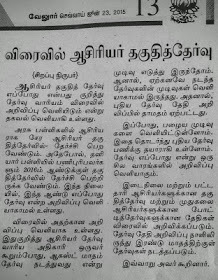 The news says about the reason for the delay in conducting TNTET Exam in Tamilnadu. Teachers Eligibility Test has been made compulsory by the Right to Free and Compulsary Education Act 2010 . According to the act, all teachers in Government and Government Aided schools should have qualified in the TET Examination coducted by the respective state governments. Teachers Eligibility Test exam in Tamilnadu has been conducted by Teachers Recruitment Board (TRB) of Tamilnadu from the year 2012 . For the first time, TNTET Exam was conducted in 2012 ( 2 examinations ). For the last time, in the year 2013 also another TNTET examination was conducted by TRB . The last TNTET examination was conducted in the year 2013 and there was no TNTET exam in the year 2014 . Regarding this delay, the School Education Department Secretary has informed that the delay in conducting the TNTET Exam in Tamilnadu is due to the Court Cases. When will be Next TNTET Exam Notification ? The Puthiya Thalaimurai News says the School Education Department Secretary has informed that the next TNTET exam notification announcement for this year ( 2015 ) will be published soon . So, dear TET aspirants, be ready to appear the examination with full confidence. Start your preparation from today itself.